In terms of features, you're not going to find much here with Windows 8 App Remover. That doesn't necessarily mean that it isn't useful, though! Windows 8 App Remover is actually a very small application which runs as a normal Windows desktop application which can quickly and effortlessly remove Metro or "Modern UI" apps which have been installed on your system. 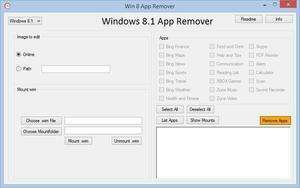 Unlike traditional application uninstallers, Windows 8 App Remover focuses solely on those pesky Apps which appears on the Start Screen. Version 1.02 is a freeware program which does not have restrictions and it's free so it doesn't cost anything. For security reasons, you should also check out the Windows 8 App Remover download at LO4D.com which includes virus and malware tests. Additional screenshots of this application download may be available, too.